Michael A. Carrier is a Professor of Law at Rutgers University School of Law, Camden. He has published and spoken widely on the antitrust and intellectual property laws, and is one of the leading authorities in the country on the intersection of these laws. 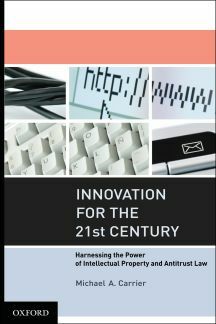 His new book, Innovation for the 21st Century: Harnessing the Power of Intellectual Property and Antitrust Law, looks at how innovation has been threatened by the United States legal system and seeks to reverse the trend, offering ten revolutionary proposals, from pharmaceuticals to peer-to-peer software, to help foster innovation. In the post below Carrier reports on today’s decision in the Cipro case. Read Carrier’s previous post here. A tidal wave of high drug prices has recently crashed across the U.S. economy. One of the primary culprits: agreements by which brand-name drug manufacturers pay generic firms to stay off the market. This issue has been raging in the halls of Congress, the courts, and the government agencies. And now, perhaps, the first full appellate court. This morning, a panel of three Second Circuit judges upheld a settlement involving the antibiotic ciprofloxacin hydrochloride (Cipro), the blockbuster drug used to treat bacterial illnesses. In a nutshell, Bayer paid firms interested in making generic versions of Cipro $398 million in return for the generics agreeing not to enter the market during the term of Bayer’s patent. This type of settlement, which is becoming more common by the day, includes a “reverse payment.” Such a payment differs from typical licensing payments that flow from challengers to patentees by preventing competition and by paying the generic more than it could have earned by entering the market. This is possible because, by delaying generic entry, the brand firm dramatically increases its monopoly profits and uses a portion of these profits to lavish windfalls on generics. Agreements like these have been blessed by most courts in recent years. Courts have explained that the agreements reduce costs and increase innovation. They have referred to settlements as “natural by-products” of the Hatch-Waxman Act (the 1984 law designed to foster generic competition and drug innovation). And they have pointed to patents’ presumption of validity in demonstrating the agreements’ reasonableness. In fact, the Second Circuit had previously made these very arguments in upholding an agreement involving the breast-cancer drug Tamoxifen. (4) “Tamoxifen relied on an unambiguous mischaracterization of the Hatch-Waxman Act” – that reverse exclusionary settlements “open the [relevant] patent to immediate challenge by other potential generic manufacturers” (when the 180-day exclusivity period in fact was reserved for the first generic challenger). In short, this is the best opportunity for an appellate court to critically review these agreements in quite some time. (The last time the plaintiffs won a case in the appellate courts was 2003, when the Sixth Circuit found a settlement concerning angina/hypertension treatment to be per se illegal). Hopefully, upon plaintiffs’ motion, the full Second Circuit will take up this vital issue and introduce some much-needed scrutiny to this area. A central policy behind the Hatch-Waxman Act, promoting generic competition and challenges to invalid patents, has been stymied by these pay-for-delay agreements. In return for millions, if not hundreds of millions, of dollars, the only generic able to receive exclusivity under the Act agrees not to challenge the patent and not to enter the market for years. The full Second Circuit may soon have a chance to remedy this situation. It can give effect to the regulatory framework provided by the Hatch-Waxman Act. It can promote patent challenges. And it can help bring lower-cost medicines to the market. Given skyrocketing drug prices and an economy making its way out of recession, there is no time to waste.